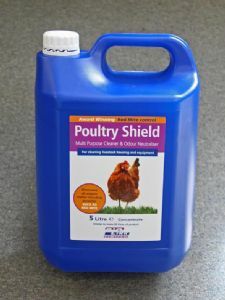 Poultry Shield is a multi-purpose cleaner and odour neutraliser. Spray liberally as it helps to eliminate all organic matter including red mite. It is ideal for cleaning all poultry housing and equipment effectively. It kills red mite by dissolving their outer waxy coating effectively dehydrating them. Use 1 part Poultry Shield to 9 parts water and use directly on housing and equipment. Use according to the instructions on the bottle.